Last Friday I met up with a few friends to give one of them a sending off….the lucky cow is spending 2 months with her boyfriend travelling South America! 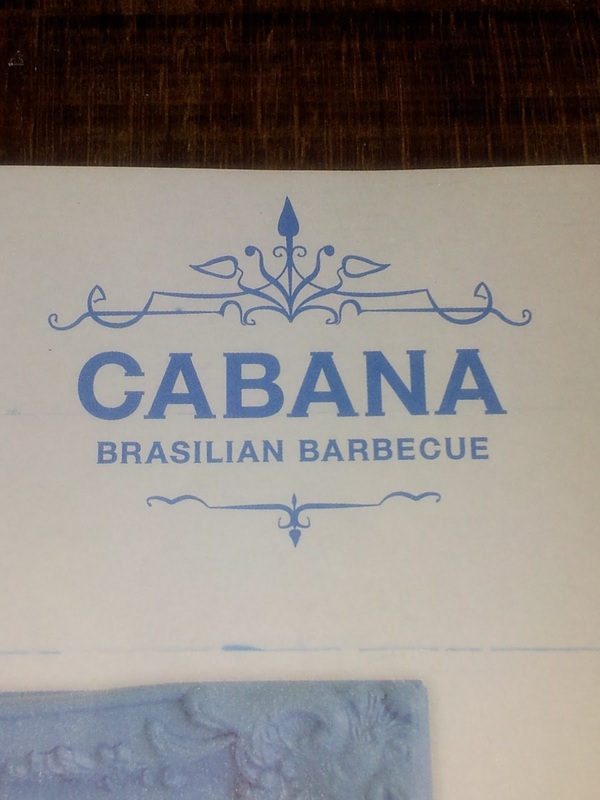 Given her travels, we thought it appropriate that we would dine at Cabana, a Brasilian eatery. Cabana has 3 branches, and we went to the Covent Garden branch which is located close to Tottenham Court Road tube station in London. 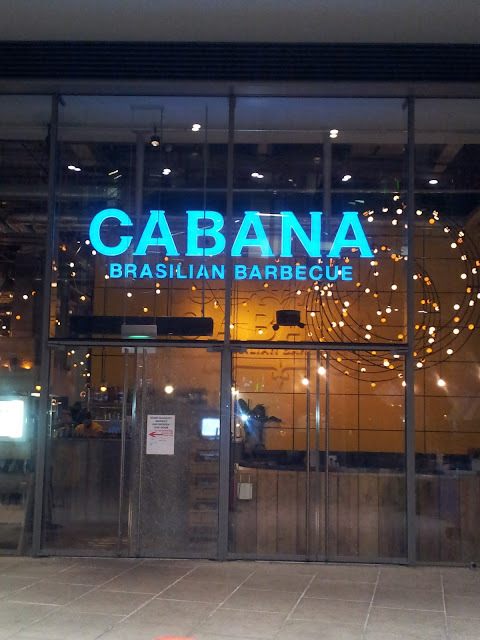 Cabana’s speciality is Brasilian Barbeque, lots of meat on skewers, with street food and sides to accompany the tasty meat. They also do burgers and have vegetarian options. We actually kept our meal very simple; we just had a main and a drink. 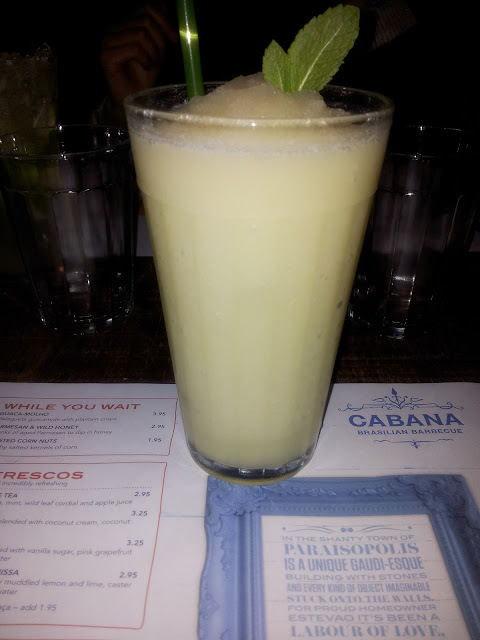 It was an icy blend of pineapple, coconut cream, coconut water and cachaca, which is a liquor made from fermented sugarcane juice. We’re currently in the season of Lent; I have mentioned previously on this blog that I’m not the best Christian around! However for the past few years I have observed the tradition of not eating meat on Ash Wednesday, Fridays during Lent and Good Friday. So my meal was essentially meat free – sitting near where the meat was being barbequed was a bittersweet experience! I don't usually eat curry when I eat out......this curry was nice. 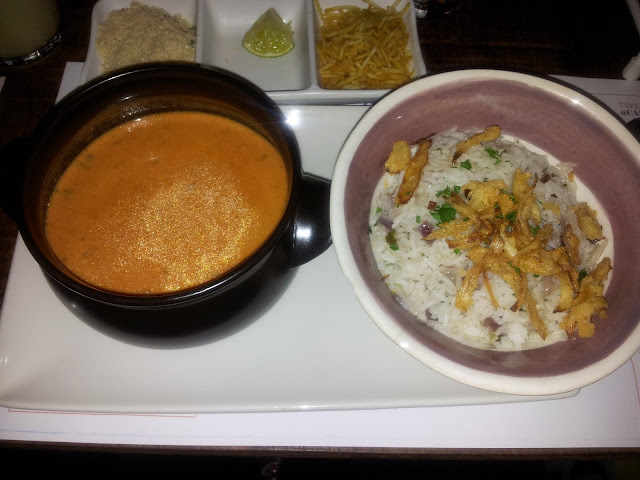 The fish and the prawns were well cooked an not overdone and I found the curry to be tasteful. the portions may look small, but my stomach was left content without being too heavy. Overall the food was decent; it made a nice change from the usual Asian cuisine (with this particular group of friends). The atmosphere was really nice; I definitely enjoyed the music that was playing and it’s an ideal place to chill with friends or go on a casual date. I love eating out in London! Mmm - I love eating out in London too. If you're ever over Paddington way you should definitely check out Jimmy Choo's restaurant Minimaxi. The wait staff are amazingly attentive and the Malaysian themed dishes are divine!